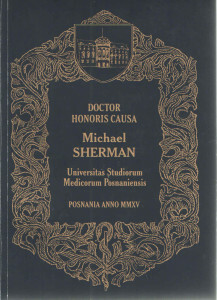 On November 18th, 2015, at the University of Medical Sciences in Poznan, world-renowned neonatologist and 29-year Children’s Medical Care Foundation (CMCF) Board Member, Professor Michael P. Sherman, was awarded the distinction of Doctor Honoris Causa by University Rector Hyacinth Wysocki. 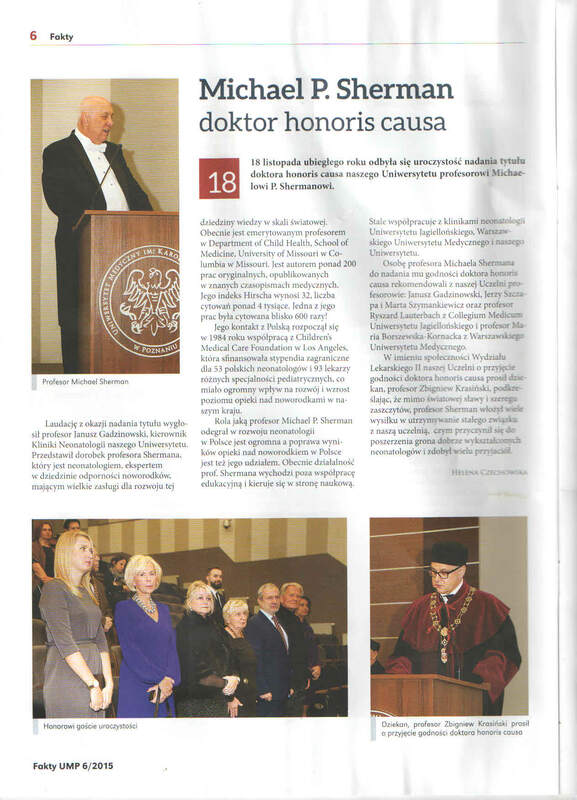 More than 170 distinguished guests attended the ceremony, including the heads of most major Polish medical universities, colleagues and former fellows, many of whom now head Polish medical societies, and major medical departments. 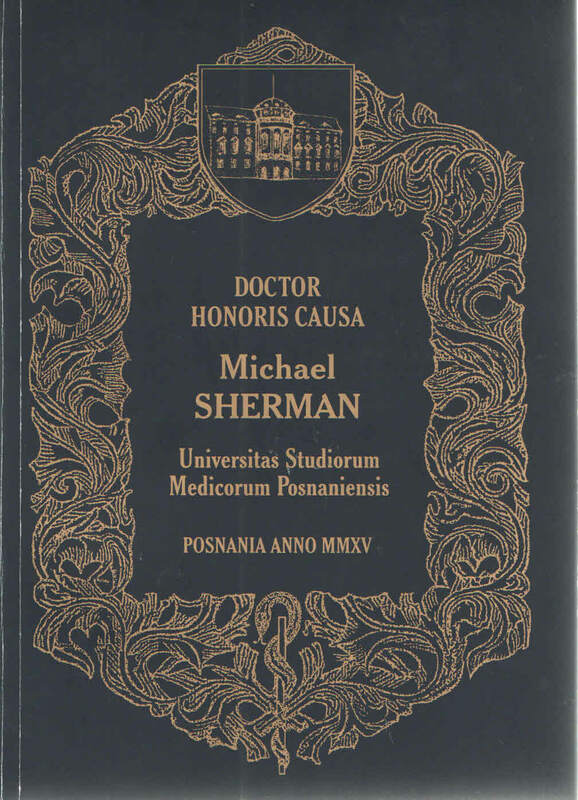 Professor Sherman received the Doctor Honoris Causa award for his nearly three decades of dedication to the cause of improving infant and child care in Poland. He first joined CMCF’s Board of Directors in 1986 at a time when the infant mortality rate in Poland stood at a staggering 26 deaths per 1,000 live births, and neonatology was not yet a recognized medical specialty. Later that year, Professor Sherman began the task of changing that when, in partnership with two Polish physicians, Professors Irena Twarowska and Janusz Gadzinowski, he organized the first ever Polish-American Neonatology Symposium at the Poznan University of Medical Sciences. It’s easy to forget, but a big part of why Poland’s health care lagged so far behind United States was that it was just beginning to emerge from decades behind the Iron Curtain, where international information sharing, such an essential part of modern medicine, was virtually non-existent. Professor Sherman was the first to open his medical department to CMCF-sponsored Polish Neonatology Fellows that same year, as an attending physician at UCLA’s world-leading Neonatal Intensive Care Unit, paving the way for many to follow. 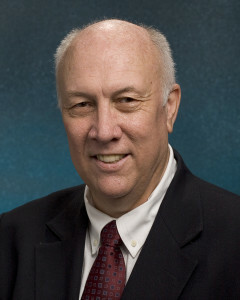 With well over 100 published research studies to his credit, Professor Sherman is also one of the world’s foremost neonatology researchers, and an in-demand speaker at medical conferences and symposia worldwide. 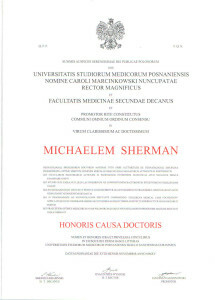 Professor Sherman has shared his passion for research generously with an entire generation of Polish physicians, mentoring them through every step of the process, helping them not only to design their studies, but to write up the research results in a way that would pass muster with review boards-several of which he has served on over the years. Today, it is not uncommon to find pioneering research conducted by his former fellows in the most prestigious international medical journals. CMCF’s long term objective has been to build international medical bridges, and one could hardly ask for a better ambassador than Professor Sherman. The partnerships he has made over the decades with Polish physicians have turned into lifelong friendships. As recently as his acceptance speech, in which he described the honorary doctorate as “the distinction of a lifetime”, and which he accepted on all of our behalf, he rededicated himself to our CMCF shared mission. Thanks to Professor Sherman’s many collaborators including doctors, researchers, donors and families a low birth weight child in Poland has just as good of a chance of living a normal life as an American one does. 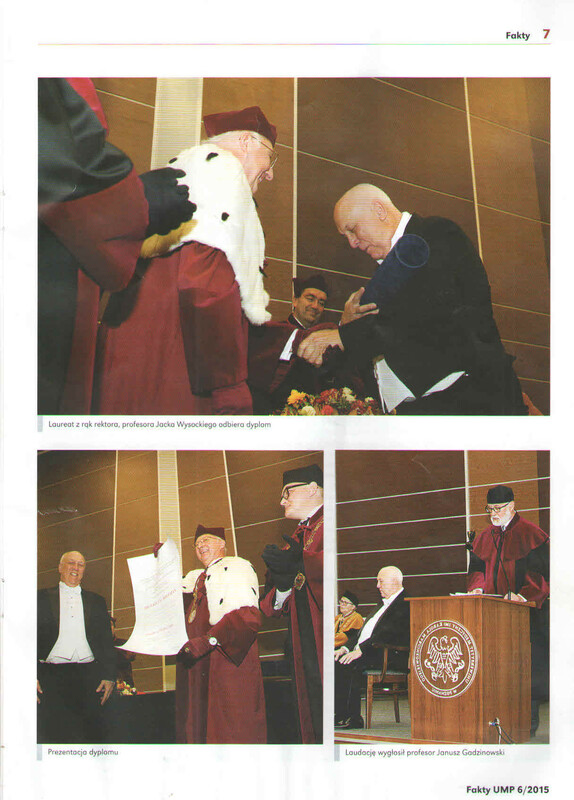 The photographs below represent the formal ceremony and the published book detailing all of Professor Sherman’s publications and accomplishments. 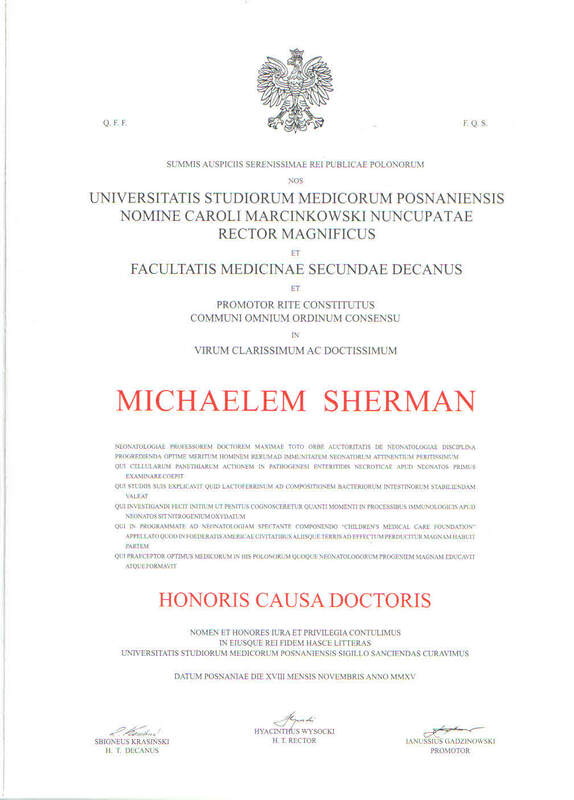 The Board of Directors with gratitude thanks Dr. Michael P. Sherman for all he has done and congratulates him for receiving the Doctor Honoris Causa. Click here for larger text and images. Bjoern Martinoff, long-time president of the Children’s Medical Care Foundation, (CMCF) a Los Angeles-based nonprofit organization that works to improve neonatal health care around the world, was awarded the Order of Merit of the Republic of Poland in a ceremony held at the Royal Castle in Warsaw on October 23th, 2014. Bestowed by the President of Poland, Bronislaw Komorowski, and presented by the Ambassador of Poland to France, Tomasz Orlowski, the the Order of Merit of the Republic of Poland is the highest of all civilian honors, and recognizes contribution to international cooperation or cooperation between Poland and other countries. The honor recognized Mr. Martinoff’s three decades of dedication to the cause of improving Polish pediatric care-nearly two decades of which at the helm of the organization. Children’s Medical Care Foundation has partnered with the California Association to Aid Ukraine to raise funds to support the realization of the first “Pediatric Emergency and Trauma Center in all of Ukraine, located at the Lviv City Children’s Clinical Hospital. Lviv City Children’s Clinical Hospital has steadily distinguished itself as a regional leader in pediatric care, and this Capital Campaign, with its preliminary budget estimate of $1.5 million, will fund renovation of four floors including associated furnishing and medical accessories. Donated medical equipment has been secured. The first joint fundraising event is in the planning stages for early spring.